Just days after his primary win Governor Andrew Cuomo was kicking off his campaign for the general election. Andrew Siff reports. De Blasio called on Democrats to unite so the party can regain control of the state Senate. New York Gov. Andrew Cuomo and New York City Mayor Bill de Blasio have set aside their contentious relationship to kick off the Democratic party's statewide general election campaign. 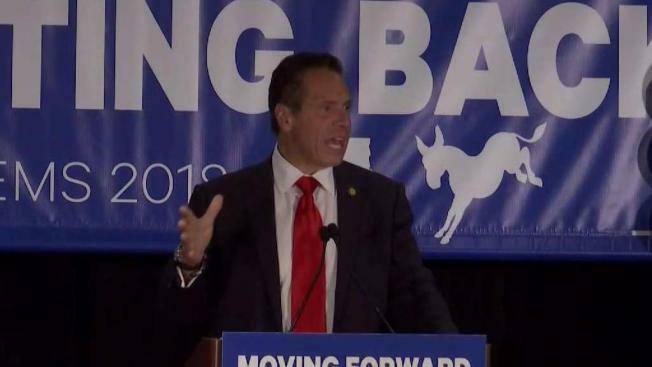 Cuomo and de Blasio exhorted Democrats at a rally in Manhattan on Tuesday, five days after the two-term governor trounced activist and actress Cynthia Nixon in the primary. Cuomo again focused his comments on President Donald Trump, criticizing the Republican's policies as detrimental to blue-collar and middle-class New Yorkers. Cuomo is facing Republican Marc Molinaro, the Dutchess County executive, in the November election. Cuomo's occasional political rival De Blasio called on Democrats to unite so the party can regain control of the state Senate. Registered Democrats outnumber Republicans in New York state by a more than 2-to-1 margin.